Perhaps you can surmise from the quote above that I am loathe to cross-examine or be cross-examined when I make a new acquaintance. I don’t want people to draw conclusions such as “She does yoga so she must love green tea.” Or, “She lives in Portland so she must be a tree-hugger who never shaves her armpits!” I much prefer getting to know a person by spending time with them. This allows me to experience them rather than pigeonhole them based on extraneous factors. I will share with you that reading and learning are very important to me. I also love to travel but not as a tourist getting off and on the bus sleepwalking through ten cities in ten days. I prefer to visit fewer places and savor the sights and locale. I love good food and workout regularly so I can eat more delicious food. I also love good books and good movies that engross me regardless of the topic. I love solitude but not being alone all the time. Even though I relish my private space, I do “play well with others”. Posted on November 8, 2015 December 17, 2015 by lorigreerPosted in My Journey, UncategorizedTagged acquaintances, authenticity. Hi there! 🙂 Love your mindset! I look forward to reading more 🙂 Cheers! I like your spirit. You write well and keep me interested in your life events. Good luck with the job! Yes, I agree. Sometimes I am amazed that people with sufficient incomes live nice lives traveling, having lots of leisure, etc. I expect it comes from living carefully, not keeping up with the Jones, etc. Thanks for commenting on and following ZimmerBitch. So much of what you’re saying resonates with me. I feel a kindred spirit when I read your posts. It’s a great feeling. I love the humor and the whimsy. Thanks so much. That’s how I felt on your blog. Bam! You perfectly said my sentiments. I like your style. I will be back on your blog soon…just have to get projects done for work…Take care! Hi, We are kindred souls in that respect. I am reading Davita’s Harp..set in the Great Depression in NYC. I am seeing the play on Sunday afternoon. Is the book you’re reading same as the movie Brooklyn? Always fun to add another book to my reading list. I haven seen the movie yet so I’m not sure. I plan to rent it after I’m finished the book so I can let you know then. I’ve never heard of the one you are reading but it sounds like my kind of book. I’m heading over to Goodreads to check it out! Thanks, Andy. I like the spirit of your blog…so kind and upbeat! Thank you. Your kind comments are most welcome. It is nice to meet you! First, that book is one of my faves. Second, I enjoyed that post. Gave me a better glimpse of you. Thank you for reading and commenting on this post. Looking forward to reading your blog also. Good way of looking at things. 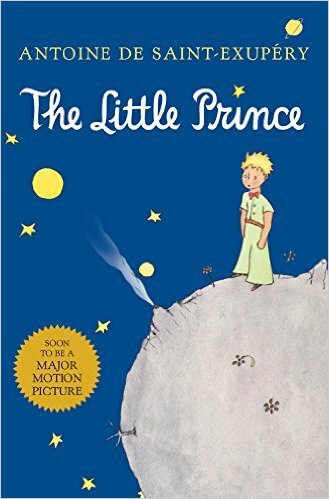 I’m ashamed to say I’ve never read The Little Prince, but I’ll get to it after I finish Lord of the Rings. It’s a wonderful little book. I have read it many times over the years. I loved The Hobbit. More reading time is a necessity! Happy Wednesday! I am glad there are still people who quote Saint Exupery. I am with you on stereotyping. In fact, I do yoga but can’t take green tea. There!